Wenzel, Brendan (2016). They All Saw A Cat. Arguably, it could be stated that the most striking feature of an outstanding picturebook is its deceiving sense of simplicity. In this Caldecott Award winning book, Brendan Wenzel presents a cat that ‘…walked through the world, with its whiskers, ears and paws…’ in twelve different scenes. As simple as that, but each scene depicts the cat through twelve different observers’ eyes: those of a child, a dog, a fox, a fish, a mouse, a bee, a bird, a flea, a snake, a skunk, a worm and a bat. There are no words to explain each observer’s point of view, but the richness and detail in colours, shapes, lines, close-ups and distant shots provide readers with the necessary elements to figure out each observer’s feelings and beliefs towards the cat. 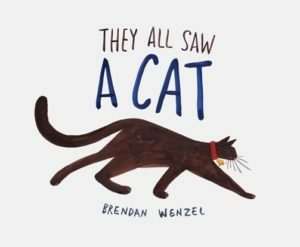 As in any other well-crafted picturebook, there are at least three layers, or even different stories, in They All Saw A Cat: the story told by the text, the story told by the pictures, and the story the reader constructs, synthesizing the text and illustrations. Although there are no explicit references to perspective and the different ways the characters in the story see the cat, the message is there to be discovered and analyzed by readers of all ages. The language is simple and repetitive, making this book ideal for a second- language class of young learners, yet the message is so profound that it makes the book also an excellent choice for older learners with a proficient command of the language. [End of Page 68] The variety of pictures and styles depicted also lends itself to detailed and rich language discussions. The last scene, offering a thirteenth perspective, with the cat finding its own reflection in the water, is a further invitation to ponder and explore. Claudia Rey is a teacher and teacher trainer based in Buenos Aires, Argentina. Her love of picturebooks is rooted in the childhood stories her grandmother used to read to her and her younger brother, her years as a first-grade teacher in an international school, her work as a lecturer in Children’s Literature, and the delightful hours she spent reading picturebooks to her son. New York: Dutton Children’s Books. Set in the 1950s with retro clothing, décor, and tasks (the mother irons! ), this charming picture book has proven to capture children’s imagination, providing laugh-out-loud re-readings when most needed. The language is ideal for young learners while the humour has levels of sophistication that keep all age groups amused. 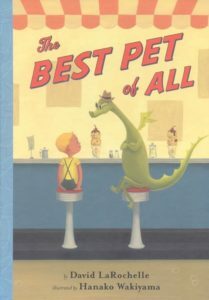 It makes a good read-aloud and the illustrations add a dimension that encourages individual reading. Wakiyama’s art is the ideal complement to LaRochelle’s story, heightening the overall reading experience. Vicki Dahl Palmquist is the publisher of Bookology magazine, an online journal for educators about books for young readers and the artists who create them. She produces a weekly e-newsletter, Fresh Bookology, with highlights from that week’s children’s literature news. Vicki studied children’s literature, librarianship, and reading instruction at Augsburg College, St Catherine’s University, and the University of Minnesota. She has worked in libraries, bookstores, and currently designs websites and print materials for creative artists. Jeffers, Oliver (2017). Here We Are. Notes for Living on Planet Earth. 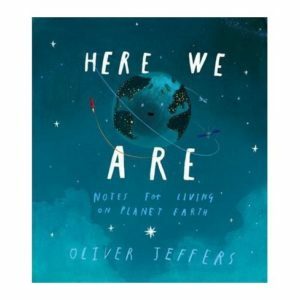 Released in November 2017, Here We Are is the latest picturebook by award-winning author Oliver Jeffers. It has a significant sub-title, Notes for Living on Planet Earth and is dedicated to his son, Harland, a newcomer to our planet. It’s nothing like the picturebooks we are used to seeing from Jeffers, but it contains much of his underlying traits. Created as though an illustrated talk from a father to a son, it’s a ‘quick tour’ of our planet, as Jeffers puts it. The simplicity of the [End of Page 70] language used reinforces its meaningful message and the beautifully illustrated pages are full of details that make us want to read the book more than once in order to genuinely appreciate it. Some pages resemble a science book for children, precise but with a hint of humour, whilst other pages portray diversity on Earth and human values. It is this humanistic dimension that makes this picturebook suitable for the EFL classroom. Young teenagers in particular might be inspired by Jeffers artwork and reading this picturebook may lead them to further reflect on and discuss citizenship issues, such as diversity, interculturality and stereotyping. Jeffers illustrates two brides getting married, a punk rocker drinking tea from a bone china tea cup, a woman wearing a burka, a nun, a child in a wheelchair, a young man dancing ballet, a muscular man reading a book, a tennis player wearing a hijab, a homeless man, and even the little boy from Jeffers’ Lost and Found (2012). 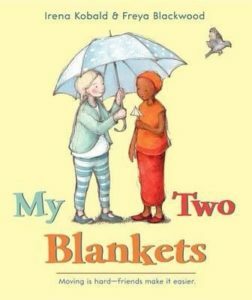 The underlying message of the book is to be kind to one another, to respect difference and to live together peacefully. Jeffers shows us a world where kindness, family and the people around us are the key to a better world. In doing so, he honours his own father, described at the end of the book as an ‘all-round good human’. Jeffers has said that this book is not only about parenting, but also about being ‘a socially responsible and environmentally responsible human being’, someone who has things to say and share. A good idea in the ELT classroom might then be to let young teens write their own ‘Notes for living on Planet Earth’ as prompts for discussion in class. Kobald, Irena and Blackwood, Freya (2014). My Two Blankets. This is the story of Cartwheel, who has to leave her home to escape war. She arrives in a strange country with strange people, strange food, strange animals and birds and even a strange wind. Full of metaphors, the narrative cleverly portrays her struggle with identity, loss, and a language she doesn’t know, ‘…it was like standing under a waterfall of strange sounds. The waterfall was cold. It made me feel alone’. She wraps herself in her ‘old blanket’, made of the words and sounds she knows and loves. But gradually, after befriending a girl in the park, Cartwheel begins to discover that it’s not so bad after all. She learns hard words and easy words, even funny words and begins to weave a ‘new blanket’, initially ‘thin and small’, but every day new words are added, until she feels warm and comfortable wrapped in either blanket. My Two Blankets can be incorporated into English lessons with learners from around A1 to support discussion around refugees and arriving in a country where everything is different. A possible activity might include asking learners to describe their ‘old blanket’. The book’s subtitle ‘Moving is hard – friends make it easier’ is a valuable message for any group of learners.